The Terminator franchise is a three-and-a-half-decade-long battle with fewer peaks than valleys. It’s been a moneymaker, but in recent years it has hit its lowest low: Terminator Genisys, a lore-breaking, awful fan-fiction of a film that killed the series in one fell swoop. 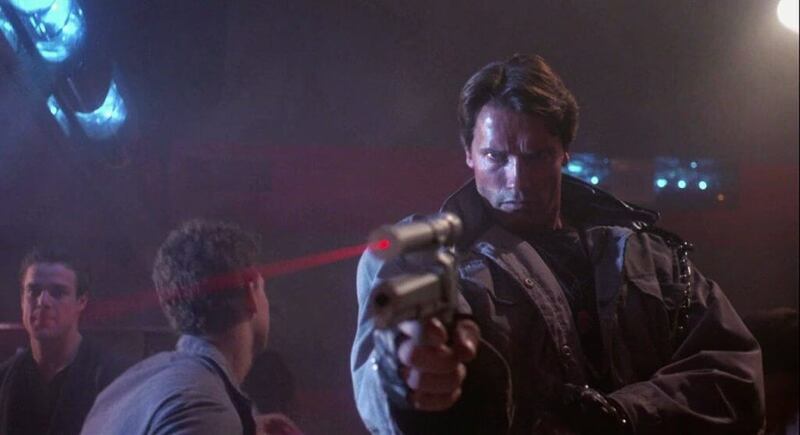 Now that Tim Miller is attempting to resurrect the franchise, and because our Patreon supporters voted on it, I wanted to talk about the movie that started it all, and why it’s an excellent action film: The Terminator (1984). James Cameron has such a visionary sense of place and world-building, even in a film I don’t particularly care for, like Avatar (2009). The Terminator is no different in this regard. From the outset, the stage is set, granting us a window into the bleak and disturbing future of man after machines take over; especially in today’s society, predominantly led by technological advances, this is absolutely chilling to consider. We see the humans battling with these machines, and not doing a particularly good job either. When we later get a more personal glimpse into this dystopian future and of how we as a species survive in these conditions, you can see where other films took inspiration. It’s also a harrowing look at a future where human beings are no longer on top of the proverbial food chain. This raises the stakes of the film, as you want the hero to survive so the bane of these machines existence can put a stop to it. Conceptually, the story for The Terminator is INSANE. An evil AI sends a cyborg back in time to murder the mother of the AI overlord’s greatest enemy. Said enemy sends his best friend back in time to protect his mother. It sounds simple when I lay it out like that, but if you separate each one of these aspects, it feels more complicated from a writing standpoint. Time travel, cyborgs, and an eventual romance, all framed with both horror and action sensibilities. The time travel aspect alone could have dragged the film down if they spent too much time on the minutia of the way time travel works within their universe. Gratefully, they don’t; they deal with it in one interrogation scene, getting the relevant points out of the way, and they’re off. Information on the Terminator itself is dealt with in a similar fashion, although with slightly more detail. They don’t get stuck in some extended exposition sequence; they put the most relevant information out there and then move on. This is more a function of the passage of time since this film’s release, but it’s crazy seeing the difference between the Los Angeles we think of today and the Los Angeles Cameron in which shot. It’s grungy and dirty, and it feels tangibly so. The darkness that shrouds the city in its night scenes really complements the tone of the film. This setting and the camerawork that works in tandem with it truly help make it feel like reality. Our lead is Sarah Connor, an average girl just trying to get by in Los Angeles. She’s pretty, but not a supermodel; she looks like anyone you could run into on a city street in that era. That’s the beauty of it: she’s relatable and doesn’t seem like some unrealistic 80’s caricature. She has issues with relationships, she has friends you can see yourself having, she has a normal job (I have worked in food service, so I can sympathize there), and she 100% doesn’t believe in what’s coming for her until she has no choice. All of these aspects of Sarah Connor are some of the building blocks that wound up making her possibly the greatest female action film protagonist in Terminator 2: Judgment Day (1992). Sarah goes on a drastic journey throughout the tight, 100-minute runtime, going from doe-eyed non-believer to a tragically alone mother-in-waiting, preparing for the future. 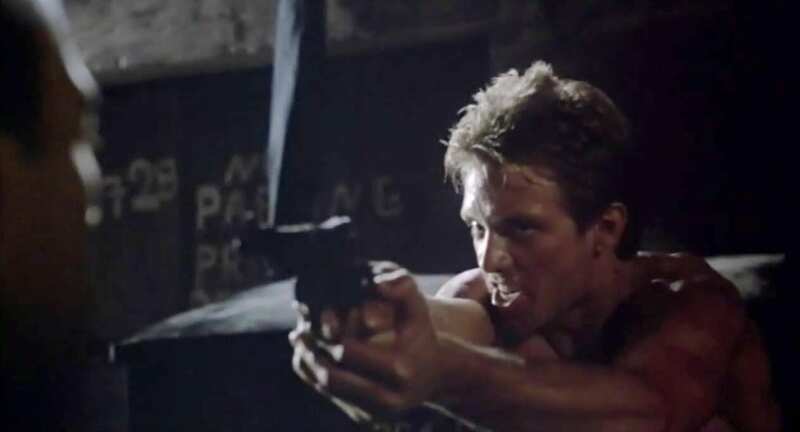 Kyle Reese is one of the quintessential action heroes of all time, period. He’s gruff, capable, and relentless, but damaged and sensitive too. He’s not a one-man-army type like the Stallones and Schwarzeneggers of the genre, and Michael Biehn is a big part of that. Reese is a much more down-to-earth type of hero. He’s a normal-looking guy who’s, to paraphrase another 80s hero, making this up as he goes. He doesn’t have the weaponry to take on the Terminator effectively; he’s got some tricks up his sleeve, but nothing the Terminator can’t handle. He gets caught by the police, he takes a beating, and he falls for Sarah in such a believable manner that even if it’s sudden, it sure doesn’t feel like it. Their relationship is a big part of the tension in the third act. You want to see these two stay together, and you don’t want either one to die. But more than that, it’s a really good romance. They fall in love during what is the most trying couple of days of Sarah’s life, and the mutual experience draws them closer. Along with the excellent dialogue (“I came across time for you, Sara.”), this is what nails their romance home, and it builds to the film’s conclusion, with the death of Reese, which is a truly emotional scene. The side characters are strong as well. Sarah’s friend is fun, and her boyfriend provides one of the film’s best laughs. The two main police characters, Lt. Traxler and Detective Vukovich (played by Paul Winfield and Lance Hendriksen, respectively), are also great. It’s frustrating to watch them not believe Reese, but why would they? In their mind, they’re doing everything they can to help Sarah, and when they die in the police station massacre, it’s saddening because they’re just doing their job. Of all the side characters, Dr. Silberman is one that most likely sticks out in most Terminator fans’ heads. He’s charismatic, he’s funny, and he’s endured even into Terminator 3: Rise of the Machines. He plays a criminal psychologist that interviews Kyle Reese after he’s arrested, and delivers one of the funnier bits in the film (“In technical terminology…he’s a loon!”). Like Traxler and Vukovich, his disbelief of Reese in the (excellent) interrogation scene grinds our gears, as we know that Reese isn’t crazy, but it SOUNDS crazy. I also want to highlight the Terminator itself. Arnold Schwarzenegger was BORN for this role, and the way that Cameron utilized this “character” is brilliant. It isn’t about a big performance or monologues or anything of the sort. The T-800 is all about presence and body language. I don’t doubt for a second that this monster of metal would murder me with systematic precision if my last name happened to be Connor. A lot of people talk about the action in the sequel, and understandably so, but the sequences in The Terminator are just as riveting – even from the very beginning, which features a desolate landscape populated by hundreds of human remains, with the Hunter Killers in the background gunning the survivors down. It’s a bleak opening with some landmark visual effects that still hold up today. The first look at the Terminator in action, when he dispatches three hoodlums, is also a strong sequence. It’s not so much about how exciting and bombastic it is, because it’s a small scene, but it’s chilling to see the cyborg take these guys down in such a visceral fashion. The image of the T-800’s bloodied hand after he’s punched it clean through one of the goons has always been seared into my mind. This, paired with our first exposure to Kyle Reese, running from the police, shirtless and shoeless, gives us a genuinely exciting and pulse-pounding introduction to the film. Let’s talk about that first foot chase because it’s something a lot of directors seem to get wrong. Cameron sets the geography up effortlessly, and when Reese is running from that first cop, Cameron gives the audience incredibly clear, wide shots so we can distinctly see what is happening. The chase moves into a department store, where Reese gets dressed and escapes from the police. You’ll see in modern films, such as the Taken franchise (easy targets, but useful to explain my point), the geography is lost between up close and shaky camera work, and epileptic editing. Seeing it done well is refreshing, to say the least. It’s also awesome that Cameron takes the time to show Kyle Reese sawing the stock off of his stolen police shotgun; this is a great little moment and informs how he managed to get a pump shotgun into a club later in the film. There’s an excellent transition from the 80’s into Kyle Reese’s nightmare when he falls asleep in a stolen car. The action that follows said transition is also great. It’s bombastic, with a pulsing score in the background, and once again headlined by excellent effects. The view this gives us of the future is terrifying, and it’s lensed as such. When Reese wakes from this sequence, he gasps, grasping his shotgun and pumping it. This informs on the mental state of Reese: he’s traumatized by the war he has lived. 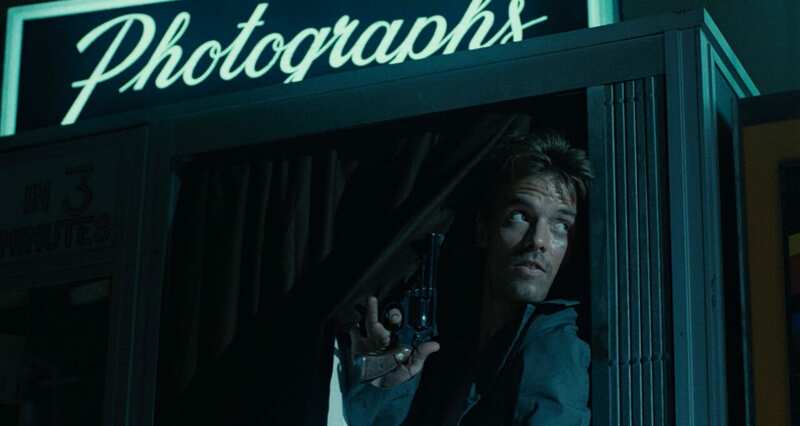 The Tech-Noir shootout is a textbook example of a flawless gunfight. The slow motion as the Terminator approaches Sarah Connor, cutting to Kyle at the bar across from them, sets the geography and the characters’ positioning in relation to each other. Then it cuts back and forth between the T-800 lining up his shot and Reese desperately shoving people out of his way. There isn’t a whole lot of sound in this sequence, aside from the tension-building score that ramps up steadily until it climaxes with the first gunshot, as Reese puts several shells into the Terminator before it goes down. Cameron also does a great job observing the 180-degree line, accurately portraying the directions in which the characters would be shooting at each other from our perspective: in this case, the T-800 is left-to-right, and Reese is right-to-left (at least at the beginning of the shootout). As the Terminator approaches Sarah, who is pinned to the ground by the limp body of a dead woman, the score ramps the tension back up as it reloads its Uzi. This tension is capitalized on, once again, by Reese saving her in the nick of time, pumping more shells into the cyborg and launching it through the front window. You’d be surprised by how many action films get the 180-degree line wrong. This sequence is quickly followed by a relentless car chase that begins with the T-800 on the hood of Reese’s car, with its hand practically at Sarah’s throat. Once the Terminator gets hold of a cop car, the chase soars. This is one of my favorite car chases; it’s just so intense. The camera moves are smooth, giving the audience a clear picture of what is going on at all times, once again clearly setting up the geography and escalating the intensity with its fantastic score and direction. 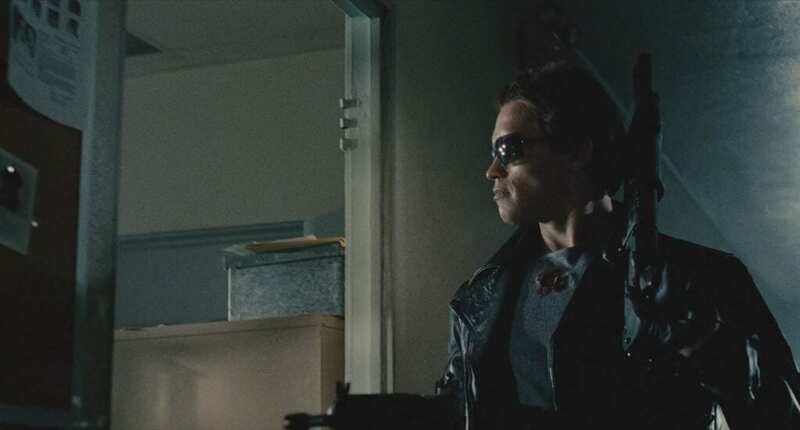 This scene also sees us finally find out what the Terminator truly is. Cameron uses this sequence as an exposition scene within a tense chase, and while I usually hate exposition dumps, somehow Cameron’s writing and directing counteract that. It also helps that Michael Biehn delivers every piece of dialogue he is given with an earnest intensity. The chase is simple; it doesn’t involve a huge number of vehicles, and there aren’t massive explosions. This is just old-fashioned filmmaking, and it doesn’t overstay its welcome. The police station massacre is brutal and chilling. Cameron gives the audience just enough time to see where each officer is before the Terminator guns them down. The camerawork is so buttery smooth, gliding with the Terminator, with excellent usage of low angles to maximize Schwarzenegger’s intimidating stature. It’s almost like watching a slasher film, where the T-800 goes room to room, systematically slaughtering the officers. I wouldn’t call the scene exciting, because it’s not photographed as such; it’s legitimately horrifying to watch. Beginning the final act is another vehicular chase, this time with the T-800 on a motorbike and Reese and Sarah in a truck. There are parts of this sequence that are clearly sped up in editing to appear faster; they are noticeable but infrequent. That’s really the only downside to this sequence. The pipe bombs put Reese and Sarah on higher ground for a change, until Reese is shot and it’s up to Sarah to defend them. I think the part of this sequence that people talk about most is the finale, when the T-800 has taken a big rig truck and is chasing Reese and Sarah down with it. Aside from the obvious threat, the musical score is EXCELLENT, driving the intensity through the roof. The most impressive part of the scene, however, is the tanker explosion. Until recently, I had no idea that they used a miniature truck for the money shot. I honestly thought they blew up a real truck on a real street. THAT is impressive. Then we enter the finale, where the T-800 is fully unveiled in all its chrome, red-eyed glory. This scene, like the police station massacre, really plays like one from a slasher film as the Terminator gives chase. 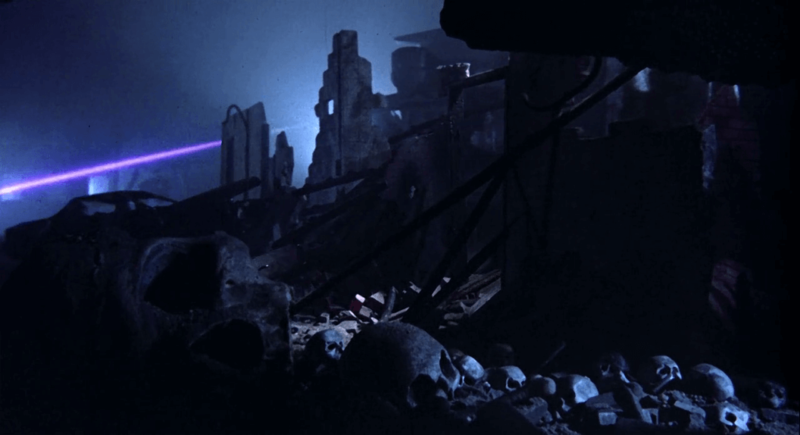 Now, I will say that the stop-motion used for the Terminator in wide shots, while great for the time, hasn’t aged the best out of all the effects. It looks a little jumpy, and it doesn’t jibe as much with the environment. I still think that Stan Winston’s puppetry looks GREAT. The Terminator itself has a wonderful design and moves as robotically as I’d expect. Watching it stalk our two protagonists is tense stuff, and the score, once again, really drives up that intensity. 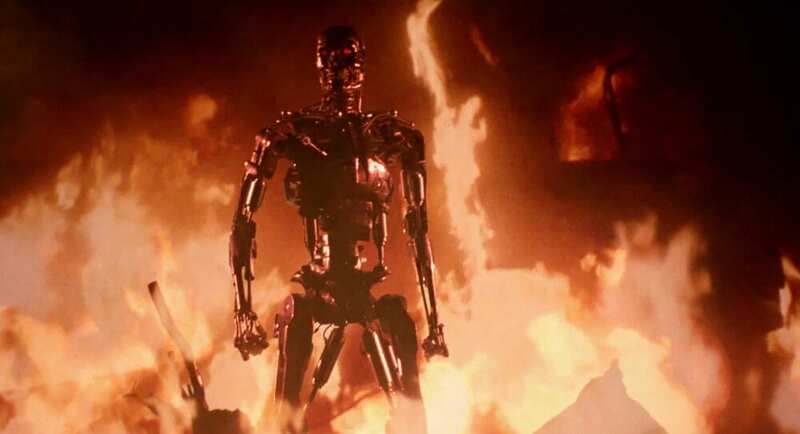 The Terminator has endured as one of the best action films of all time because it endeavors to not just be a great thrill ride, but also a deep sci-fi film with notes of horror, and to be driven by a strong central theme: a warning about the dangers of technology. It’s also benefited by spending just the right amount of time defining the characters as not just relatable, but human. What do you think of The Terminator (1984)? Is it your favorite of the franchise or do you prefer it’s also-excellent sequel? Let me know in the comments below! Stay nerdy everyone.